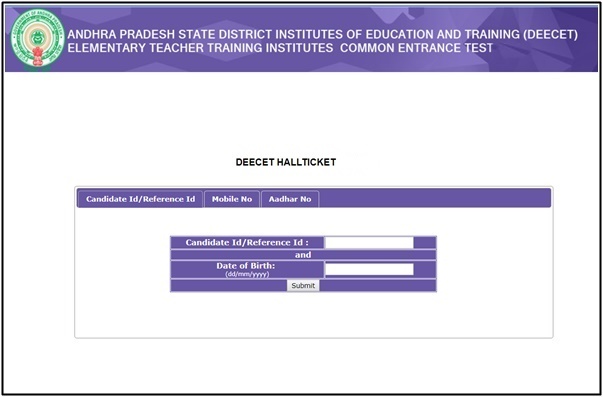 AP DEECET 2019 Hall Ticket : Commissioner of School Education, Government of AP has scheduled the AP DEECET Examination on 15th May and 16th May 2019. This year a large number of competitors have applied for AP DEECET Examination. All the hopefuls who are waiting for AP DEECET Hall ticket 2019 can now proceed to download from the official website, apdeecet.apcfss.in. The Commissioner of School Education AP has made accessible the AP DEECET admit cards as the examination date is nearing. Hence candidates can hurry up to download hall tickets and preserve them safe to carry to the examination. By visiting the above-given site, candidates can find the AP DEECET Hall Ticket download link on the homepage. Later enter the required details such as register number, password etc to download the hall ticket. Hopefuls can get their e-admit cards from today, 10th May and it is presently accessible to download. Andhra Pradesh District Institute of Education & Training Common Entrance Test (AP DEECET), is also known as AP DIETCET. This examination is annually being organized by the AP School Education Department is to offer admission in 2 years Diploma in elementary education in Private and Government District Institutes of Educational Training in Andhra Pradesh. Yearly, many of the hopefuls compete for this examination to get admission in D.Ei.Ed courses. The competition is higher this year, as per the reports announced by Commissioner of School Education AP. All the hopefuls competing for the DEECET can download AP DEECET Hall ticket from today, 10th May onwards. And it is presently accessible from the official portal, apdeecet.apcfss.in. Candidates will not be allowed to proceed with the examination if they do not show the hall ticket at the time of verification. Hence all the candidates must download and carry the hall tickets while going to the examination. Also, candidates can check the information of their examination venue, date, and timings details from the hall tickets. Once check all the details after downloading the hall tickets. Candidate’s name, date of birth, father’s name, signature, photograph and others will be mentioned on AP DEECET Admit Cards. Candidates can check all the details and report to the authorities for any of the corrections in spelling mistakes of any columns. Click on the official link to download the hall ticket. Then enter required details in specified columns. AP DEECET Hall ticket 2019 will appear in new page. Take the hard copy of the document for further usage. Sir maa brother dhi ht miss aindi ht no ledu results mundu ht details andubatulo unchu tara?